Hiroshima Toyo Carp outfielder Masato Akamatsu made an awesome catch the other night. Is that the greatest catch ever? TSN is airing the exceptional ESPN 30 FOR 30 film project. If the idea of some of Hollywood's finest filmmakers creating documentaries centered on the last 30 years in sports sounds interesting to you, you'd absolutely love this series. I PVR the series and steal a documentary viewing every chance I get. I just watched Barry Levinson's The Band That Wouldn't Die. In the early hours of the morning of March 29, 1984, Robert Irsay had fifteen Mayflower trucks hurriedly pack the Baltimore Colt's property and transport it to Indianapolis. Robert Irsay broke the hearts of the Colts faithful, and 12 years later, Art Modell would do the same to Cleveland Browns fans. Modell, owner of the Cleveland Browns, secretly negotiated with the State of Maryland to move the franchise to Baltimore for the 1996 season. I always found it rather unsettling that Baltimore, so devastated by seeing their team leave for Indianapolis on a snowy winter night, would see NHL football return to their city by stealing Cleveland's beloved team. That had to be bitter sweet. Here's the Baltimore Colts fight song that made grown men and women cry in Levinson's The Band That Wouldn't Die. I highly recommend you start watching ESPN's 30 For 30 if you aren't already. I've changed my mind. 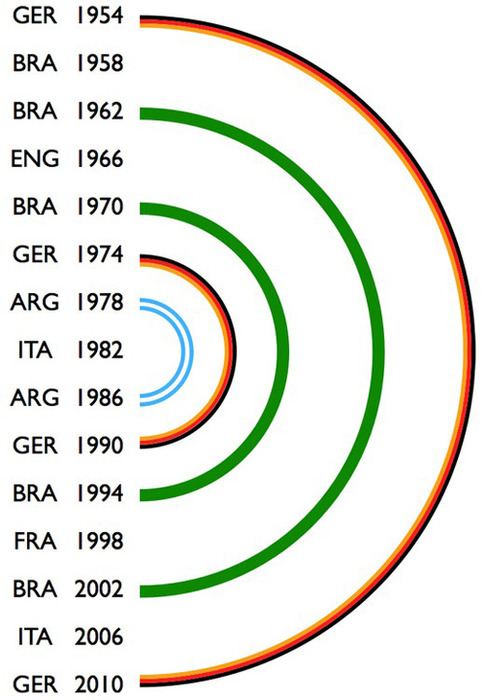 Despite what I wrote earlier in the week, Germany will not win the 2010 World Cup. 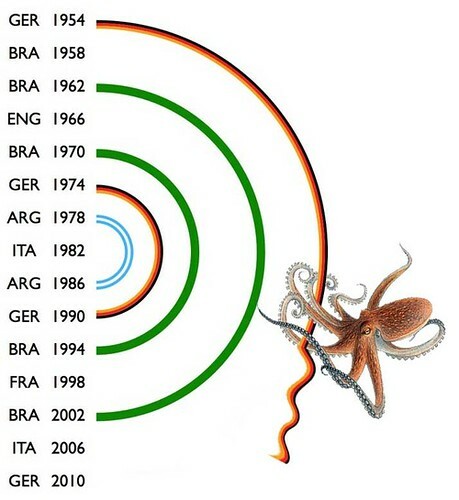 I blame Paul the psychic octopus. Every four years, I miraculously transform into a soccer aficionado. I'm actually surprised they're still going through with the semi-final matches this week. I mean, why bother? Germany can't lose this World Cup. Unless I'm sitting at BMO Field, I couldn't care less about soccer, unless it's World Cup soccer. Every four years these games suddenly become scheduled viewing for me. I was pumped tuning into England vs. Germany this morning, and couldn't believe how exciting a match it was. With England down 2-1, you know what happened. 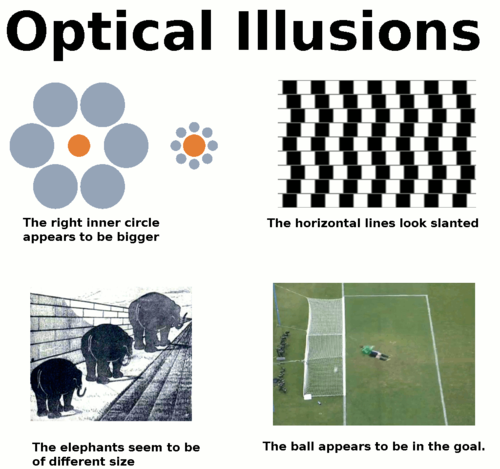 It inspired this fantastic new optical illusion. I was just reading about the year 1883 in baseball. My 19 run inning forced me back in time, and I enjoyed reading about a baseball season exactly 100 years before I started checking the boxscores and standings on a daily basis. Here are the final standings from 1883. 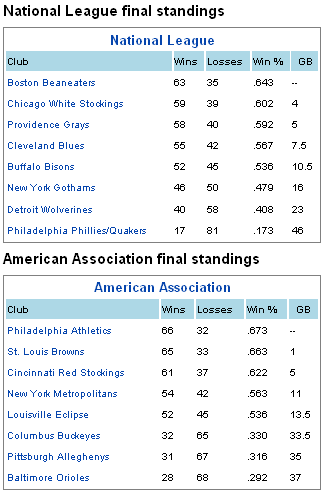 The American Association champion Philadelphia Athletics declined to play the Boston Beaneaters for national championship status. Looking back at 1883, it's interesting to see how things have evolved. Providence, Buffalo, Louisville and Columbus no longer have teams. White Stockings have become White Sox, Red Stockings have become Reds, Metropolitans have become Mets... some nicknames have disappeared completely, like Browns, Alleghenys, Beaneaters, Blues, Gothams and Wolverines. But the most interesting difference from 1883 to now is how they used their starting pitchers. There were no pitch counts or four days of rest for these warriors. Charles Radbourn led the league that year with 48 wins. The very next season, Radbourn would have the greatest statistical season in the history of the game. He went 59-12 with a 1.38 ERA and 441 strike outs in 678.2 innings pitched. They don't make 'em like they used to. And yes, you can follow Old Hoss Charles Radbourn on Twitter. He's @OldHossRadbourn. I'm okay with the vuvuzelas. I find they give this World Cup a signature sound and create a sense of anticipation. Everybody wants them muted, but I don't mind them one bit. They also inspired this hilarious animated gif. 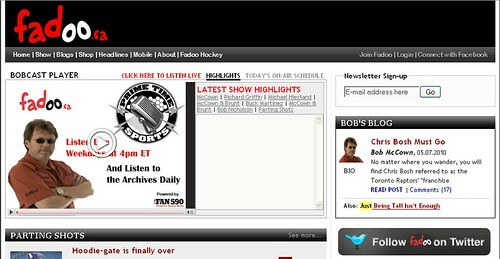 Bob McCown from The FAN 590 started a web site called Fadoo.ca. I used to subscribe to the RSS feed, but unsubscribed because it wasn't being updated very often and the content quality noticeably dropped. I got an email from Bill the other day about Fadoo.ca. I just visited Fadoo.ca and found one line of copy: "Fadoo.ca has been closed." It's completely gone, with just Google's cache left behind. I don't know why Fadoo.ca bit the dust, but my spidey senses are tingling. Did Rogers put pressure on Bob McCown to shut 'er down? Once again, I'm without a rooting interest in this World Cup. I faced the same dilemma four years ago. At that time, with neither my #1 Canada nor my #2 Ireland represented, I decided to go three deep and root for the Netherlands. By June 15, 2006, I had changed my mind and adopted Trinidad and Tobago as my team. 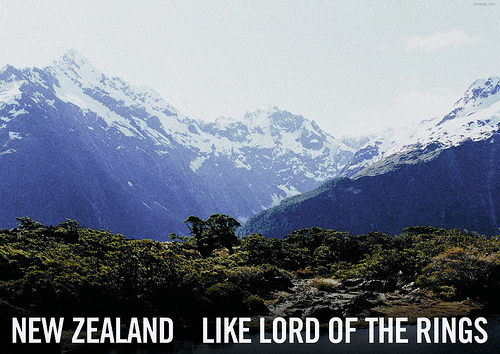 At this time, the Netherlands is still an option, but I'm leaning toward pokies New Zealand. Why the hell not? I love Flight of the Conchords, the other me is from there and they're major underdogs. That works for me! And before I leave this World Cup entry by a guy who only watches soccer when he's at BMO Field or during the World Cup, I have to remind you all about FootieFox. FootieFox is a Firefox extension that I loved during the last World Cup. It put the current score in my status bar and played a "Scores!" soundbite whenever a goal was scored. If you can't watch the games, you'll love FootieFox. Download FootieFox here, and go New Zealand go!. Every year I make sure I'm watching when the Stanley Cup is clinched and the cup is awarded. There's no better spectacle in all of sports. I love watching each player hoist Lord Stanley's mug, it's the toughest trophy to win, after all. I thought I might miss that magic moment last night because I had a slo-pitch game until 11pm, but thanks to overtime I was there when Patrick Kane scored the winner. I'm not a Kane fan, but I was rooting for the Blackhawks. They waited 49 years for a cup, and now it's our turn to own the drought. 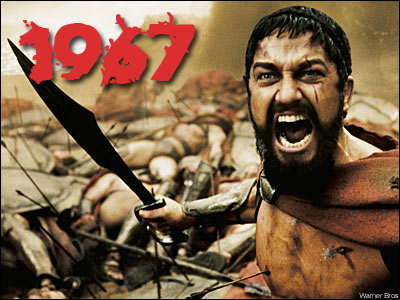 The chants of "1967" are now our rallying cry. I can't wait. In my annual playoff pool, Pops won the big money thanks to his Flyers trifecta. Outside of Pops, only one Flyer was actually drafted. Pops, you deserve the big win. Because he had two Blackhawks vs. Ryan's one, Steve gets his $20 back. I tried to catch as much NHL playoff action as possible. It's truly a marathon and not a sprint, but I never tired of it. Nothing beats playoff hockey. Nothing. If you fancy your chances, find & compare the Best NHL odds for this season at canada.betfair.com. I miss hockey already. Go Leafs Go!